Hand Quilting – Simple Folk – It's a T-Sweets day! Published on January 20, 2019 by Tracy @ It's a T-Sweets Day! 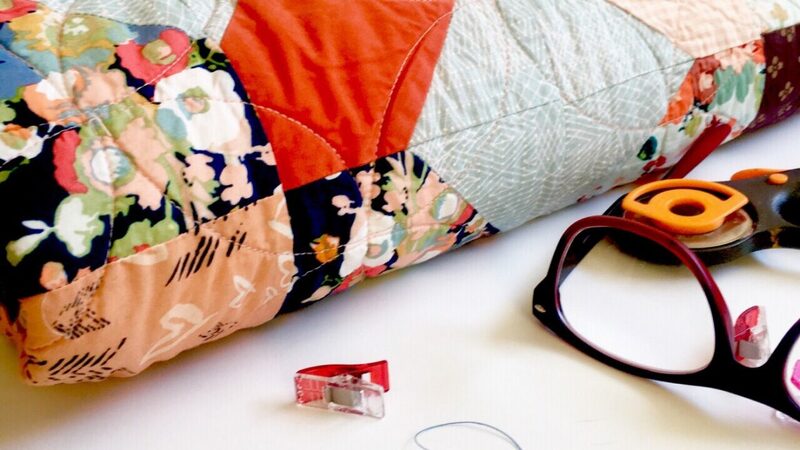 I am happy to introduce you to my next hand quilt along project, Simple Folk. This is the 2018 project by Sarah Fielke I enjoyed stitching up her Down the Rabbit Hole so much, that I jumped right into her next appliqué project as well. I have been stitching on these blocks since the middle of December. Aren’t they beautiful? I have learned to use a fine sand paper to hold my fabric as I mark it for needle turning. I also like how Sarah recommended making a fabric from strips to add a bit of dimension. Do you see the strips in the egg shaped flowers? What a great idea! The blocks are the perfect size to sew in the evenings. Some are harder while some are easier. This Swan block stitched up in no time at all. I am glad that I learned the “foil” method for making circles. There are a lot of circles in this quilt! I can do a bunch of them at the same time. Yea!! I like the quiet stitching these blocks require. It is relaxing to me and as an added bonus they help me stay awake at night. It’s funny, but if I am not sewing, I seem to fall asleep! Are any of you like that? Well, I have been busy sewing away. I like each of the blocks sew sew much! I hope you are having a wonderful day! Thank you sew much for dropping by:). The thing I love about Sarah’s foil circles trick is that you can use it for other shapes too – it’s great for leaf shapes as well, so long as they’re not too long and skinny. Your quilt is looking great and coming along really fast, well done! Thank you Kate! I am going to have to give the foil a try on some of the many leaves in this quilt as well. Great idea!! You’ve done so much–I can’t believe it! Looking great! Gorgeous work! I’m going to have to try that foil fabric and my circles. Thanks for sharing! I have to stitch or crochet during extended TV watching (think General Conference) or I fall asleep. I plan ahead for quite a while to make sure I have work available. I think I already know that it will, Tracy! Love all these blocks but I think the swans are my favorite. Sarah’s next BOM is just a couple of weeks away, getting excited! Those blocks are so lovely. Truly a labor of love. I laughed when you said you needed to stitch in the evenings or you would fall asleep. I am EXACTLY like this!! We sit and watch our shows in the evenings and I have to be stitching something or I am out! Oh wow! They are beautiful,I’m impressed! Gorgeous! Wish i were able to participate. Great progress! Your curves are looking pretty smooth after all the work on Down the Rabbit Hole. These are really lovely blocks. I look forward to seeing your progress next time! Love this quilt! You do amazing work and I love your tips! I would never have thought of using sandpaper or foil!